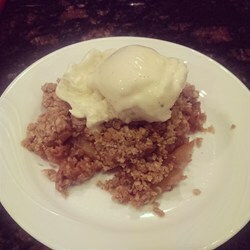 This is a very good recipe for apple crisp made with oatmeal. Serve warm or cold. 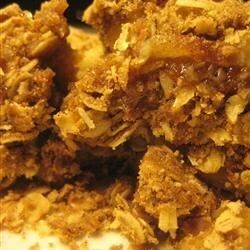 In a large bowl, combine the flour, oatmeal, cinnamon, nutmeg and brown sugar. Cut butter into mixture until crumbly. 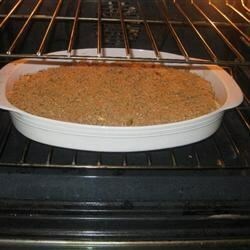 Take half of the mixture and pat it into the bottom of a 9×13 inch baking dish. 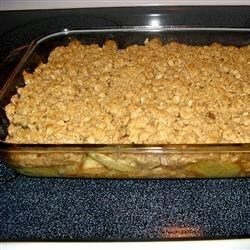 Cover crumb mixture with apple slices, then sprinkle apple slices with remaining crumb mixture. Bake at 350 degrees F (175 degrees C) for 45 to 50 minutes or until apples are tender.